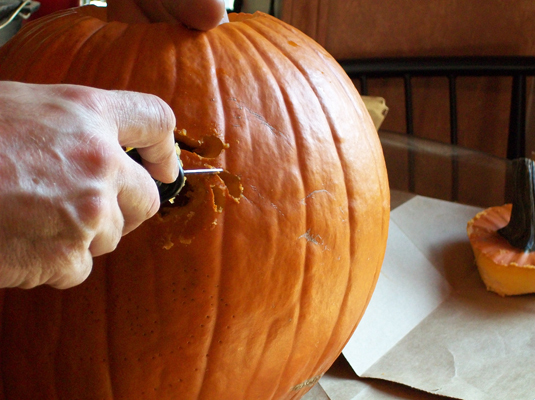 Cut a hole into the top of the pumpkin by using a long, thin knife; remove the top. Insert the knife, at an angle, a few inches away from the stem. Make sure the hole will be large enough to place your hand in for removing the seeds and membrane. 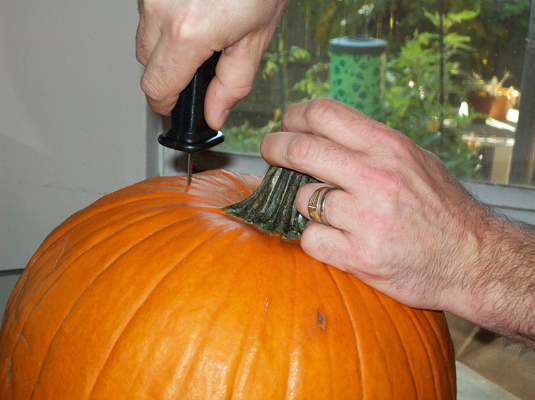 Alternatively, you could cut a hole from the bottom if the pumpkin doesn’t have a stem or to suit your design. Removing the guts is also easier! 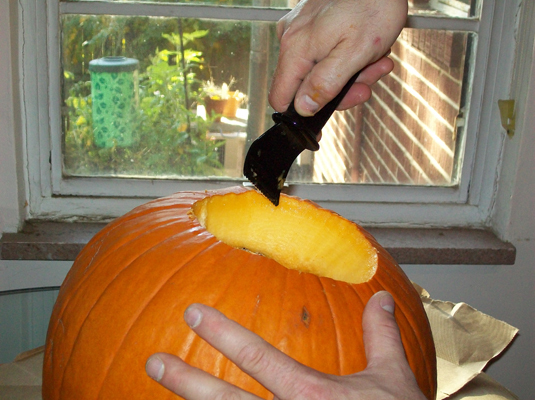 Scrape the insides thoroughly, using an ice cream scoop, large spoon or pumpkin carving kit scraping tool. Tape your pattern to the pumpkin and use a punching tool to score the lines of your design onto your pumpkin, punching indentions approximately 1/8 to 1/4 inch apart. Don’t poke the tool completely through the flesh. 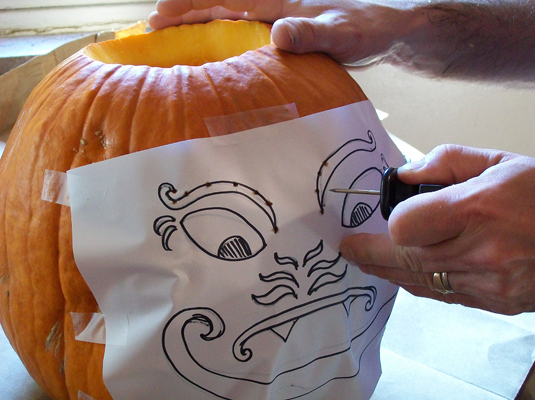 Remove the pattern occasionally, checking to make sure you’ve adequately outlined your carving lines. With a serrated knife or sawing tool, saw, don’t slice, through the pattern lines using short back and forth motions. Push out the pieces, and trim the edges. You control the cuts better by sawing. Use a paring knife to trim the edges and to cut the inside of the holes at about a 45-degree angle to allow more light to shine through. Smooth a light coating of petroleum jelly on the cut edges. Place a candle in a glass votive cup inside your pumpkin and light it. Place the top back on, or leave off. A battery-operated “candle” is perfect for safe, fuss-free light. 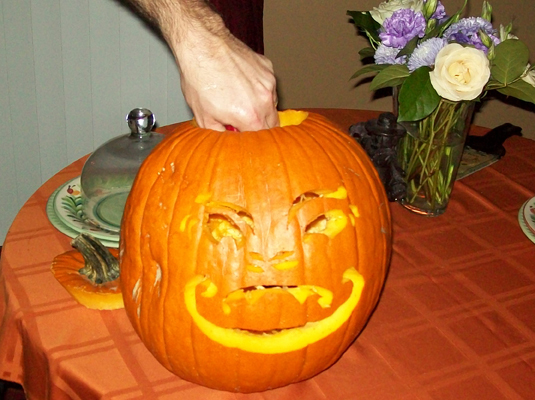 Optional: Photograph your jack-o'-lantern to commemorate the fun — or an especially creative design. To photograph your masterpiece, turn off your flash, so that your camera doesn’t bounce light off the surface of your object leaving your photo bleached out and non-dimensional. 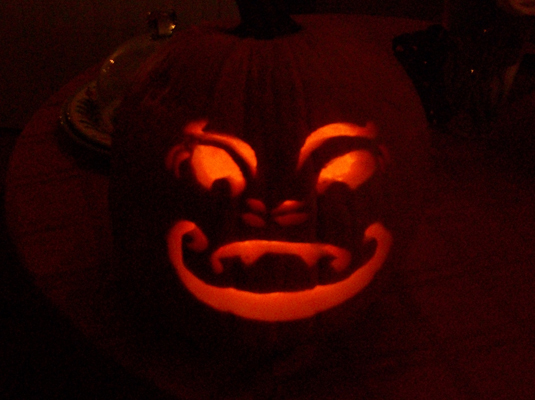 A pumpkin is lit from within. What you want to do is capture that by artificially lighting the image from the front with lamps, candles, or other subdued lighting without using flash photography. You’ll enjoy the eerie effects you get.